The IMRO was founded in the city of Thessaloniki by a group of anti-Ottoman Macedonian Bulgarian revolutionaries. It was predominantly ethnic Bulgarian. The organization changed several names; the best known are the Internal Macedonian-Adrianople Revolutionary Organization (IMARO) and the IMRO (since 1920). Its original aim was to gain autonomy for Macedonia in the Ottoman Empire. In 1903, the IMARO organized the Ilinden Uprising against the Ottoman Empire. Although the uprising failed, it was an important milestone in the Macedonian revolutionary struggle. 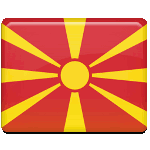 The IMRO actively participated in the liberation of Macedonia during the Second World War. After the establishment of communism in Yugoslavia, it de facto ceased to exist. Day of the Macedonian Revolutionary Struggle is a national holiday established to pay tribute to all known and unknown heroes who fought for the independence of Macedonia. It is marked with official speeches, solemn ceremonies, and other appropriate events and activities held throughout the country.